“Long after my name is forgotten, and the names of all the scientists who worked on this have been forgotten, the work that we did and continue to do at the University of Pittsburgh will stand through the ages. 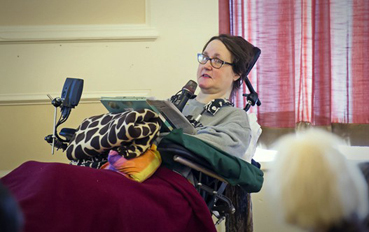 It will be built upon and it will benefit generations of people who are facing neurological challenges.”-- Jan Scheuermann of Whitehall, PA, who has a paralyzing neurological condition and is unable to move below her neck. Scheuermann spoke at Brain Day 2017 about her part in a Pitt research project that allowed her to use a robotic arm and hand just by thinking about it.